Figure 12.4. Fusidic acid, an inhibitor affecting EF-G.
translocation intermediate into the post-translocation state ribosome is the hydrolysis of the EF-G-bound GTP that induces the conformational change of EF-G and the subsequent release of EF-G from the ribosome. Thus, three aspects of the contribution of GTP and its hydrolysis to the translocation step can be considered, in accordance with the series of the reactions listed above (Section 12.2.2). First, GTP serves as an effector inducing the proper conformation of EF-G (or eEF2) that possesses an affinity to the ribosomal translocation intermediate and thus pulls out the ribosomal complex from the pre-translocation state (reactions 1 and 2). There is evidence that the main body of EF-G:GTP binds to the factor-binding site of the large ribosomal subunit, and it may be believed that the protruding domain IV of EF-G falls on the A site of the small subunit. GTP can be replaced by its non-hydrolyzable analog, such as GMP-PCP or GMP-PNP (Fig. 9.5) in performing this function. Second, GTP is a destructible effector. It is hydrolyzed on the ribosome-bound EF-G (eEF2). Thus the effector is abolished, and the resultant relaxed conformation of EF2 allows the translocation intermediate to turn quickly into the post-translocation ribosomal complex, with the peptidyl-tRNA in the P site. In other words, the cleavage of GTP is required for exiting from the transition state. The process is analogous to the decay of a transition state intermediate into products in the case of a covalent enzymatic catalysis; the cleavage of GTP plays the energy role of the covalent reaction catalyzed by an enzyme. There is also the third aspect of the problem under consideration: due to reduced affinity of EF2:GDP to the ribosome, the dissociation of EF2 from the post-translocation ribosomal complex is caused by GTP hydrolysis. The use of a non-hydrolyzable GTP analog has demonstrated that translocation can be also catalyzed by EF-G:GMP-PCP or EF-G:GMP-PNP, though slower than with EF-G:GTP (Rodnina et al., 1997). In this case, however, EF-G after translocation remains associated with the ribosome. It may be that the translocation intermediate fixed by the active (tight) conformation of EF-G is capable of spontaneously converting into post-translocation ribosome, but with EF-G still bound. This relationship is the result of the fact that the effector inducing EF-G affinity to the ribosome is not destroyed and therefore EF-G continues to be retained in the complex. However, the presence of EF-G on the ribosome blocks the subsequent step of the elongation cycle: the binding of the ternary Aa-tRNA:EF-Tu:GTP complex is precluded due to the occupancy of the factor-binding site on the 50S subunit and, maybe, the A site on the 30S subunit. 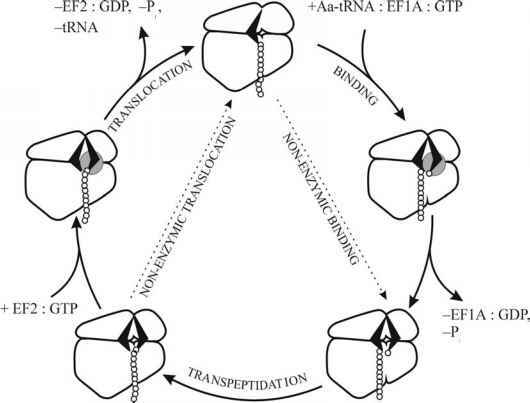 Therefore, as a result of the translocation effected by EF-G with a non-hydrolyzable GTP analog, peptidyl-tRNA acquires the capacity to react with the acceptor substrate (competence to puromycin), and deacylated tRNA may be released from the ribosome; however, such post-translocation state ribosomes cannot bind the next aminoacyl-tRNA and, hence, are unable to continue the elongation. In experiments conducted in vitro, EF-G together with the non-hydrolyzable GTP analog have been washed off from such post-translocation ribosomes, resulting in the capacity to bind aminoacyl-tRNA and to continue elongation (Belitsina et al., 1976; Girbes et al., 1976). This implies that during the normal process EF-G should become attached to the ribosome in order to induce translocation and then should leave the ribosome to allow the next step to occur. In this respect, the action of fusidic acid (Fig. 12.4), an antibiotic specifically affecting EF-G, proves to be interesting. EF-G in a complex with fusidic acid normally interacts with GTP and further with the ribosome, the interaction being followed by GTP cleavage to GDP and orthophosphate. Thus, the normal translocation is completed. Fusidic acid, however, acts to increase the affinity of EF-G to the ribosome, and EF-G:GDP is not released after GTP hydrolysis (Bodley et al., 1970). As a consequence, in spite of translocation occurring, the next aminoacyl-tRNA cannot bind with the ribosomal A site, and therefore elongation stops. It has been established, using bacterial cell-free systems, that translocation can proceed in the absence of elongation factors and GTP (Pestka, 1969; Gavrilova et al., 1976). This "non-enzymatic" translocation takes place far more slowly than the EF-G:GTP-catalyzed process. Nevertheless, it yields a normal post-translocation state of the ribosome, capable of continuing elongation. It can be concluded that translocation is a thermodynamically spontaneous event. The translocational mechanism appears to be an intrinsic property of the ribosome itself, and is not fully provided by the elongation factor. Again the situation appears to be very similar to that of aminoacyl-tRNA binding: the processes may occur slowly in the factor-free mode, proceeds spontaneously (downhill), and their mechanisms are provided by the ribosome; therefore the elongation factors catalyze only thermodynamically permissible and mechanistically ensured processes. Factor-free (non-enzymatic) binding of aminoacyl-tRNA, ribosome-catalyzed transpeptidation, and factor-free (non-enzymatic) translocation constitute the factor-free elongation cycle. This cycle is designated by dashed shunting arrows in Fig. 12.5. Repetition of this cycle results in a slow factor-free elongation. 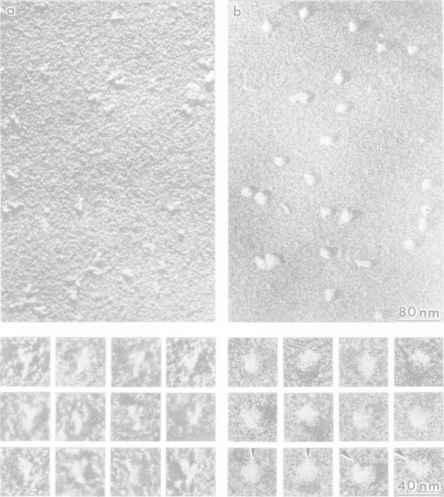 Bacterial cell-free systems have been used to perform factor-free translation of polyuridylic acid and a number of synthetic heteropolynucleotides. It has thereby been shown that the polypeptide product corresponds completely to the coding sense of the template polynucleotide. Whereas an increase in the Mg2+ concentration stimulates aminoacyl-tRNA binding, a decrease in Mg2+ stimulates translocation. At Mg2+ concentrations of about 3 mM in a bacterial cell-free system, the rate of factor-free translocation approaches that taking place in the presence of EF-G with GTP, but little aminoacyl-tRNA binding occurs. At Mg2+ concentrations of 30mM, the translocation rate is close to zero, but the factor-free binding of aminoacyl-tRNA is good. Thus, by alternating the Mg2+ concentration in the cell-free system, the action of the elongation factors might be simulated and the rate of the factor-free elongation cycle increased. The alternating Mg2+ may be considered as a way of the energy provision for speeding the factor-free elongation cycle. Figure 12.5. Sequence of events during the factor-catalyzed elongation cycle. Broken lines designate factor-free bypasses: non-enzymatic binding of aminoacyl-tRNA and non-enzymatic translocation. suggesting an identical translocational mechanism in both cases, involving identical targets. Thus, the existence of factor-free (non-enzymatic) translocation indicates that the translocational mechanism is intrinsic to the ribosome and is principally provided with energy without the involvement of GTP. As has been noted, translocation involves shift of a template polynucleotide by one codon in the direction from the 5'-end to the 3'-end. During this shift and after its completion, pairing between the anticodon of peptidyl-tRNA and the template codon is thought to be retained; the codon-anticodon duplex appears to move as a whole, from the A site to the P site of the ribosome (Matzke et al., 1980). It is natural to wonder what plays the active part in the translocation: movement of the template or movement of the peptidyl-RNA. Several observations suggest that the shift of the template by one codon is driven by the translocational displacement of tRNA: through its anticodon tRNA pulls the codon of the template. An impressive demonstration of the lack of dependence of the translocation on the template polynucleotide was the discovery of ribosomal synthesis of a polypeptide from aminoacyl-tRNA in the absence of any template polynucleotide (Belitsina et al., 1981); the elongation cycle, including EF-G:GTP-catalyzed translocation, was demonstrated in this case. The most direct evidence of the active (driving) role of tRNA and the passive (driven) role of mRNA in translocation was obtained by Riddle and Carbon (1973); in their experiment, mutant tRNA with a nucleotide quadruplet instead of a triplet as an anticodon suppressed the (+1) frame-shift mutation; in other words, it moved the mRNA in the ribosome, correspondingly, by four (and not by three) nucleotide residues. Thus, it is likely that the principal event in translocation is the movement of peptidyl-tRNA from the A site to the P site of the ribosome. The anticodon pulls the template codon associated with it, leading to a corresponding shift of the template relative to the ribosome by one triplet (normally). This results in the positioning in the A site of the next (in the direction of the 3'-end) nucleotide triplet of the template, while the preceding (the 5'-side-adjacent) triplet, together with the anticodon of deacylated tRNA, leaves the P site. At the same time an additional mechanism for actively pulling the mRNA chain through the ribosome in the 5' to 3' direction cannot be excluded. A clue comes from the observations of 3'-ward slippage and hopping of translating ribosomes along mRNA under conditions when codon-anticodon interactions weaken or disrupted (see below, Section 12.4.3). The ideas about an intrinsic capability of the ribosome to count nucleotides or to shift an mRNA chain preferentially by triplets have been proposed (e.g., Trifonov, 1987). The movement of mRNA relative to the ribosome exactly by three nucleotides during translocation is the absolute requirement for keeping the reading frame in the course of translation. Errors, that is non-triplet translocations, are possible, however, and the result is the frameshifting. After a frameshift within a given mRNA chain, no correct codons are read out anymore, a polypeptide chain having no similarity with the encoded protein is synthesized, and the synthesis terminates soon because of a high probability of stop triplets out of the correct reading frame. Thus, the translocation errors have more severe consequences than miscoding during aminoacyl-tRNA binding. Generally, mRNA chain can be occasionally moved by less or more than three nucleotides during translocation, concomitantly with the normal passage of peptidyl-tRNA from the A site to the P site (for reviews, see Weiss et al., 1990; Atkins & Gesteland, 1995). The most frequent translocation errors are those when mRNA is moved either by just two nucleotides (-1 frameshift) or by four nucleotides (+1 frameshift), instead of moving by regular nucleotide triplet. The average probability of such errors (the level of frameshifting) in bacteria has been estimated to be from 5 x 10-4 to 10-5 per codon of mRNA. However, the errors occur mostly at certain codons ("shifty codons"), and certain tRNA species ("shifty tRNAs") may be involved. In addition, the context can play a decisive role in inducing a frameshift and determining the direction of the shift.